The company Headed Reinforcement Canada was established in 1992 to set-up a production unit in Newfoundland, Canada. This production unit produced more than 2,2 million T-Headed Bars for the Hibernia platform and a smaller amount of T-headed bars for the Prince Edward Island Bridge. HRC group has produced over 15 million reinforcement products to a wide range of projects globally. Metalock Industrier AS was established in 1979 and began in 1985 production of T-Headed bars and mechanical rebar splices/coupler systems to offshore installations in the North Sea. Metalock Industrier is divided into several departments, of which HRC Europe markets the construction products. The company delivers a wide range of specially developed bolts and other products for the Norwegian Railroads and Road works. In addition the company serves the domestic and European construction industry. Metalock Industrier AS has produced T-Headed Bars and reinforcement couplers to several offshore installations as for example Oseberg, Gullfaks C, Troll, Heidrun, Sleipner A&B, Draugen, Ekofisk and more. HRC Europe also undertakes production set-up in other parts of the world i.e. the Middle East and Russia where the company has supplied mobile production units. Headed Reinforcement Corp. was established in 1990 in response to the special demands for high quality reinforcement in the seismic region of California. Being the focus branch of the HRC group, Headed Reinforcement Corp. undertakes most of the testing and certification of new HRC products. Headed Reinforcement Corp delivers a wide range of products for construction and retrofit of bridges, parking houses and other concrete structures to the entire American market. CALTRANS Department of Transportation, State of California has pre-qualified a wide range of HRC’s products for use in seismic regions. 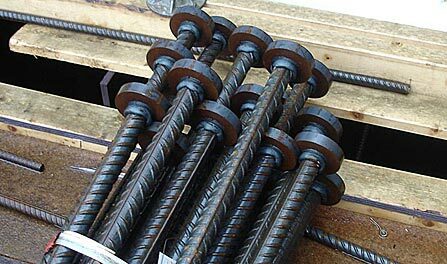 These products being mainly T-Headed bars and rebar splices/couplers. The HRC group is the largest owner of specialized friction welding machinery for production of reinforcement products in the world. This machinery is stored at different sites in several countries and can be set-up at customer’s production site upon request. HRC’s unique production method is the friction welding method. This method is a known method in everything from the car to space industry. HRCs production machinery has been developed, designed and built by HRC especially for production of reinforcement products. The HRC production method secures full traceability of the products, and comes with an electronic monitor of surveying and storing each weld. This is an automatic quality assurance process that is part of a computer based ISO 9002 quality system of the production. This system has been developed to fulfil the strictest quality assurance requirements for offshore projects. The machinery comes with a technology package for training of local staff.